At some point you would have felt to have a text to speech software installed. You might be getting exhausted by reading lengthy and boring texts. Hence you would have definitely thought of installing or downloading the best text to speech software. TTS software enable you to sit back and relax and listen to the text. As a result you can enjoy your time relaxing and listening to the text. To save you the pain of searching best of the text to speech software, I have compiled the list. I have tried to provide the short description as well with each of the software along with the supporting link. You can also take help from these talk to text apps, if you want to convert any talk to text. Ivona is one of the well known software for converting text to speech. It is used and trusted by a large number of people all over the world. Recently it has been announced by amazon that it would replace Ivona with cloud based product which is amazon Polly. As per amazon, Polly has the capabilities of converting text into lifelike speech using deep learning. Amazon have done a tremendous work on this software. As a result they have used advanced deep learning technologies to synthesize speech that sounds like a human voice. Another well known software in this category is Natural Reader. With this software all you need to do is to copy and paste the web page URL and leave the rest on the application. The best feature of this application is to highlight as you listen. This feature could be really beneficial for the people with disability and people who are suffering from dyslexia. They also provide the online solution, an mobile app and desktop software as well. Natural Reader supports almost all of the documents like PDF DOC etc. Zabaware is an text to speech software which uses synthesizer to read documents. The most important thing is that this software for speech conversion is available for free with generic voices. Zabaware could read multiple types of data like email, news letters, clipboard contents documents etc. They have also provided the high speed option to complete the text to speech conversion quickly. This would help the quick listeners grab it fast. Other people could easily take help of this text to speech translator for quick proof reading. Software like this also helps visually impaired as they just need to select the text and it would start converting to speech. Zabaware also provide a greate technical support if you need any. Like others, this is one of the great text to speech (TTS) software. The main positive point that Balabolka has is, it is light software of about 15 MB in size. The on-screen text could be easily saved as a WAV, MP3, MP4, OGG or WMA file. 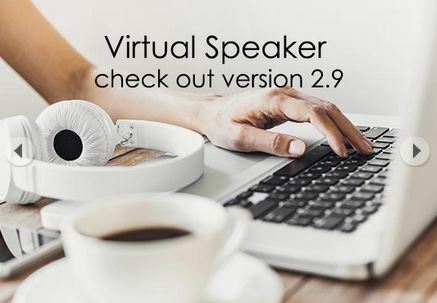 Developers have provided the option for user as they can apply a special substitution list to improve the quality of the voice’s articulation. They have also provided a very special option, you can also extract the text out of a speech which is a very useful option for all the journalists out there. This is one of the prime examples of top and best text to speech converter. The high quality output provided by this software is regarded as best among the corporate. It helps and plays a major in e-Learning, authoring, customer relation services, public announcements and brand management. It also supports more than 70 voices in 30+ languages. Acapela TTS software also provide the automatic mode which helps in conversion of long list text files to sound and speech files. They also provide perfect audio and sound controls. Verbose is a perfect fit application for those who are not techy and are looking for plain and simple yet effective software for speech conversion process. Hence I would like to recommend this software for those people who like software with easy and plain GUI. You can save the speech in MP3 format. Change voice characteristics setting to change speed, pitch and volume. This software could read text from outlook and website and of course from the text files. Conversion is very smooth and error free. It is also considered as best voice recognition software for people with low vision, or reading disabilities. This is one of the classic software. Text to speech online free version is available on the internet with basic features. They have included highly customizable clipboard and mouse monitoring systems along with spell check. After including the drag and drop features, they have improved this software a lot. 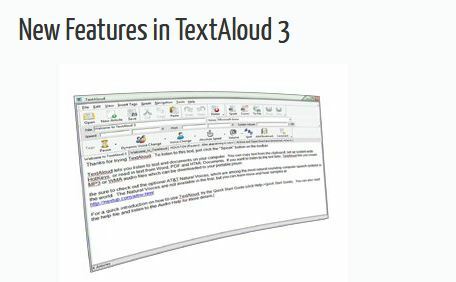 This easy option lets you add articles by dragging one or more files from Windows Explorer, and dropping them on the TextAloud 3 main window. For more info about this software you can visit their website by clicking the link below. This is very cool application. Since this is very basic software it supports only three languages.English, French, and Spanish. The basic software is free for you. For advanced purposes you can easily purchase this application. There are multiple options to convert RSS feeds, convert web pages. You also have the option to user the RSS podcast, watch or see public recordings and use video creators. For using this tool you can simply visit their website where the free version and paid version is available. For better usage it is recommended to purchase the paid version. Cepstral is one of the latest application or we can say a company which has only focused on text to speech (TTS). Hence they have a quality products related to the same. They assure us that they make realistic synthetic voices that say anything, anywhere, with personality and style. Helping people with multiple text to speech voices in software and applications. Products related to Alerts, Education Medical , Mobile, Personal and Telephony are some of the examples. These applications are used by middle, small and large scale companies. As a result I can say that they have a high quality text to speech software that could help you. If your need is just basic text to speech voices conversion that you can go with this software. They have very basic UI as a result this is very easy to use software. Hence I have listed this at the bottom of this list. They have integration with Linux and windows applications. You will be surprised to know that application only take approx. 1 Mb space on your hard disc. Being a less weighted software has helped the processing of this software. eSpeak does text to speech synthesis for the following languages. Thanks for sharing Best Text To Speech Software List but i like Cepstral. Anyway great job . kep it up. Really Great article, it is very helpful software. Do we have anything from google ? I guess we do have or I am missing something ? Do these software support Japanese conversion ? ?